For the most part I was a typical seventies teen. Some of my clearest memories are of me at the mall, begging my mom (unsuccessfully) for clothes that no good mother would let her daughter wear. Perhaps you recall hip huggers, but I wanted hiphuggers that laced up the front. What can you expect from a kid who grew up watching the Mod Squad? Saturdays, though, were different. In the wee hours of the morning, I donned a black melton wool coat, canary breeches, and ascot tie. In weather that kept most sane people snug in their bed, I braved the frigid temps to ride with the Romwell Foxhounds in pursuit of the elusive red fox. The fox always eluded us, which is just as well as far as I'm concerned. The photo on the right is a picture from those days -- my friend Lori and I at the Blessing of the Hounds. St. Huberts medals which were given out at each Blessing. I still have the seven I collected dangling from my old stock pin. 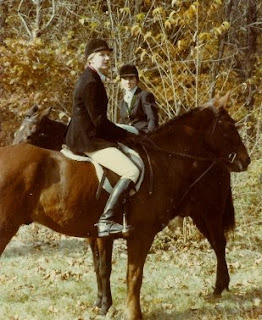 The Romwell Foxhounds was based at the barn where I learned to ride, and I was invited to join by a friend's mom who was a whipper-in. 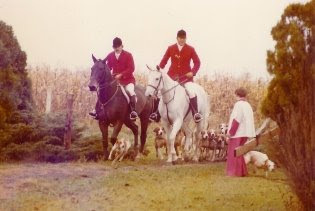 Foxhunting is associated with the east coast, but Indiana farmland provided a stunning backdrop for this traditional sport. The terrain was relentlessly flat and uniquely beautiful, especially in the fall. In the winter the morning frost covered everything and the breath of humans and horses drifted up like smoke. Nothing but fields and sky in every direction, and only a few outcroppings of trees and solitary farmhouses in the distance. My mount was a lesson horse named Foxfire. Fox was the penultimate foxhunter, the living breathing definition of an honest horse. His one quirk was that he periodically did a capriole while we waited our turn to take a jump. Fox was of unknown lineage but he could really jump. We jumped as high as 4 feet, usually a chicken coop style, at least one or two times during each season. 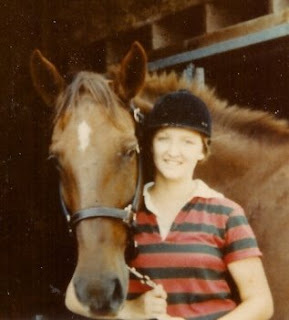 I dreamed of owning Foxfire, but he was one of those golden school horses that no money could buy--my parents told me in my adulthood that they had inquired about buying him. I never knew. I don't know how I managed to snag him for foxhunting. My first season riding with the hounds had a shaky start. The highlight of the first year was a) a feeling of almost constant terror and b) having the Master of Foxhounds (MFH) yell at me in front of the whole field. He yelled at everyone, though (he was also my riding teacher). Year Two I was awarded my colors -- the right to add a velvet bottle green and wine collar on my black coat. That was also the year my enjoyment and understanding of foxhunting deepened. The only times I ever skipped school I wasn't smoking pot or shoplifting, I was out with my friend Lori on the Thursday morning foxhunts. Far from discouraging our behavior, the other members of the field offered us swigs from their silver flasks. One moment we would be standing/waiting quietly, and the next we were careening across a field. So exhilerating! There were sad moments too -- one horse died in the field (he had COPD and had an attack), and one day I wasn't in the field, a young woman was killed in a nasty fall. Foxhunting is the closest I've ever come to eventing. Rolex reminds me of my foxhunting days, and the "old timer" eventers (Denny Emerson?) learned to ride cross-country by foxhunting. I didn't appreciate how lucky I was to stumble onto foxhunting; if only I could thank the people who gave me the opportunity and a horse to ride. The memory of riding Foxfire over endless rural landscape will always be with me. Few things during that period of my life were worth remembering, but the time I spent riding with the hounds was absolute magic. Disclaimer: Foxhunting is an elite sport associated with the monied class. Don't get the impression I'm a trust fund kid :-). My folks were teachers in a public school system. Foxhunting is the best! I was hooked almost immediately. I used to event, but this is better: all cross country and then a great "tea" at the end. It's a wonderful excuse to ride through some of the most pleasing territories with a bunch of like-minded individuals who like to move along! And it doesn't have to be elitist. One of the reasons I joined my hunt is that the members are down to earth, friendly souls many of whom keep their horses at home. That's not to say that there aren't some truly snobby hunts, but no one should be discouraged from trying it out. Stacey, I love reading your blog. You must change the word "penultimate", I didn't get the impression from your story you ment "second to last". I enjoyed reading that. Such events are few and far between in Texas. There is one place in north Tx that does it, and you can take young horses roading with the hounds, but its' too far away. I did live in Indiana for 2 years, and we knew a woman who fox hunted. I remember seeing areas in the fencing that were made for horses to jump over. Thank you for the info. Alas, I'm so jealous. I've always wanted to try hunting. There is a club only 15 minutes from me. Their website invites new people to try it out, but I think I'd feel more comfortable with a friend or acquaintance to go with. Great Post! I have had the good fortune to ride as a guest years ago with one of the Masters of our last remaining hunt here on Long Island. His family was very involved in hunting and I got to borrow one of their seasoned hunt horses to do it. What a rush! I'll never forget that all-out gallop around the farm field when the hounds picked up a scent! My dream is to try it with my horse Monty, but he seems better suited to the hunter paces. Some of these pictures are very familiar! I don't think I rode with the hunt for as many seasons as you did, but it was always a fun time whether on Rufus, who was game for anything, or Pepper, who was a crazy bundle of energy. My husband says that fox-hunting doesn't sound elitist if you hear all the stories about four a.m. wake-ups, galloping into the mud or slush and, most importantly, cleaning up after yourself all the way through the process! I remember Rufus, the athletic Saddlebred, also a really cool horse. And Batik? And Heronymous? I wish I know what ultimately happened to our old mounts. A pleasant retirement I hope. Thanks for this post. I know so very little about foxhunting and appreciate how you shared what your experiences were. You have a great writting style that is easy and entertaining to read. This is my favorite post on your blog. I admire fox hunting and it's always a great joy to find a book or an article, let alone a blog post about it. 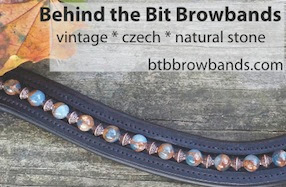 :) This post was really unexpected and such a pleasure to read!